In a small sauce pan, combine the barbecue sauce, apple juice, mustard, worcestershre and brown sugar. 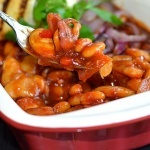 In a large bowl, combine the beans and sauce mixture. Add the red pepper and bacon crumbles. Pour in a baking pan that has been lightly sprayed. Bake for 30 minutes or until thick and bubbly. Grill red onion slices. Set aside. Lightly spread vegan margarine on the toast and grill both sides. You can rub the whole garlic clove on them when they are toasted. Alternately, you could melt the vegan margarine with the garlic and brush the bread prior to or after grilling. Serve the grilled onions on top of the beans and alongside the toast. © 2018 AIMEE STOCK | THE VEG LIFE!